The Wabash College Global Health Initiative is excited to announce its most recent cohort of Global Health Initiative Fellows. GHI Fellows are students who have shown intensive involvement and engagement with Wabash GHI programming such as summer internships, work experiences, and immersion learning, and who seek continued involvement in curricular and co-curricular opportunities addressing population health. 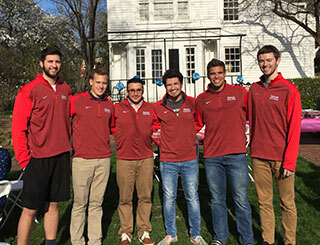 Those students most recently named GHI Fellows are Dan Azar ’18 (Valparaiso, IN), Joey Ballard ’20 (Evansville, IN), Jared Cottingham ’18 (Lowell, IN), Artie Equihua ’20 (Crown Point, IN), Cody Gryzbowski ’18 (Munster, IN), Matt Hodges ’19 (Carmel, IN), Michael Jennings ’18 (Beech Grove, IN), Joey Lenkey ’19 (Greenwood, IN). GHI Fellows are selected based on their ongoing commitment to the Global Health Initiative and public health, with recognition of their leadership potential and investment in the Wabash GHI community. The hope and expectation is that Fellows will continue to support GHI programming such as participation in speaker series events, internships, and the student Public Health Organization activities; provide feedback on current GHI activities through formal and informal assessment; represent the GHI to prospective and current students as well as alumni; and communicate the GHI mission to stakeholders. The students are already involved in a number of public health related activities including working for the Montgomery County Health Department, the Montgomery County Free Clinic, Half Way Home, and the Frontier Nursing Program, and have completed immersion learning experiences in Peru, Ecuador, and Haiti. Azar and Grzybowski will be enrolled at the Indiana University School of Dentistry in the fall, joined by Jennings at the IU School of Medicine. Cottingham will be at the University of Pikeville School of Medicine in Kentucky. The undergraduate students all will be completing GHI internships this summer, including the Montgomery County Health Department and IU Health; in Health Information Technology in Chapel Hill, North Carolina; and as a summer undergraduate research fellow at Dartmouth University.